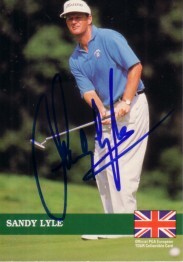 1992 Pro Set golf ball autographed by 1988 Masters Champion Sandy Lyle, a reluctant signer. With certificate of authenticity from AutographsForSale.com. ONLY ONE AVAILABLE FOR SALE.